Lighting the Set • Strangetown, USA. 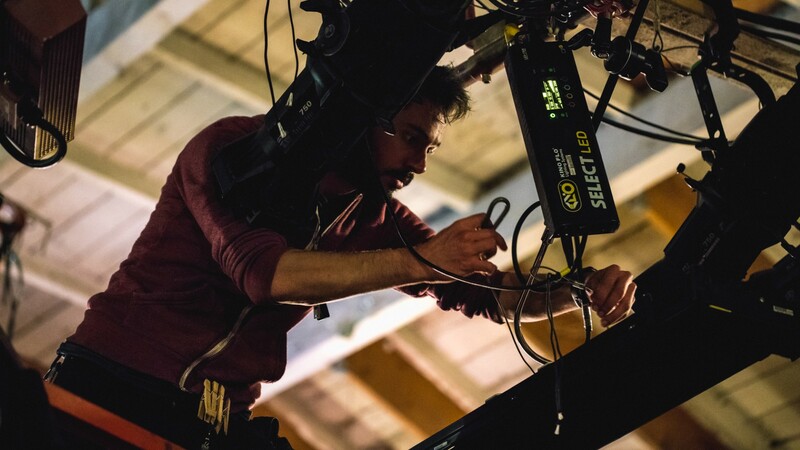 Adam “Ready” Richman, cinematographer, dives deep into what it was like to light the set with Smokin’ Electrics and industry pros Zac Baney and Eric Corriea. We sourced all of our units from DTC Grip & Electric in Oakland, who were incredibly supportive from the start. If you need G&E in the Bay Area, DTC is your spot. One tricky part of the equation was getting the gear to the warehouse. We weren’t renting a truck from DTC, partially because we couldn’t afford it, and partially because it didn’t make sense (it would have required a permit to park it, and we would have just emptied all its contents into the warehouse anyway). 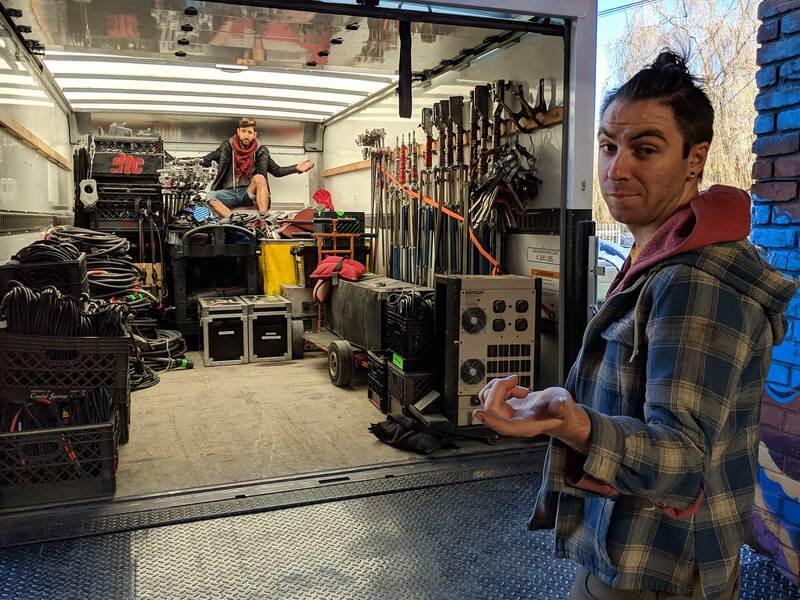 This meant that every piece of gear had to be loaded into a personal vehicle (or, in our case, three vehicles). Fortunately, our community had our back, and we were able to borrow both a proper (albeit small) box truck and a full size pickup from our build team (thanks Wolfgang and Way) to ease the transfer. 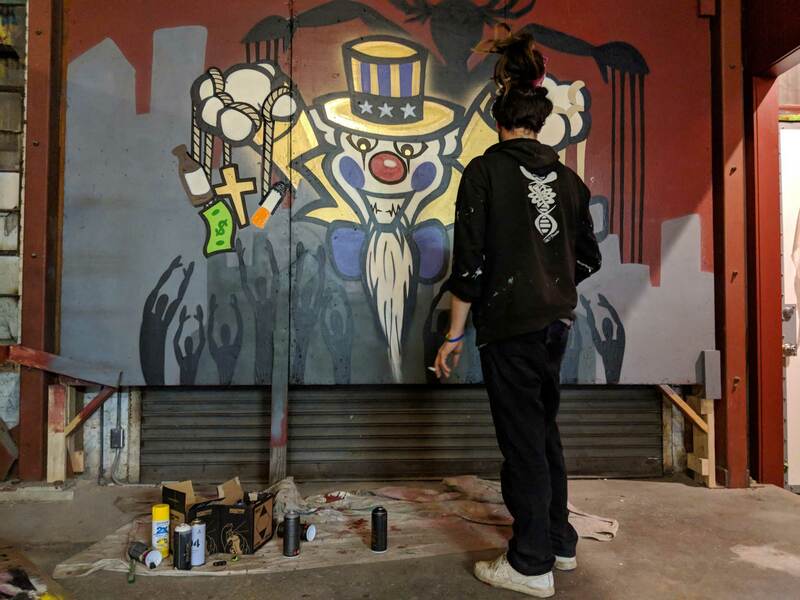 Since the gear wasn’t ever leaving our warehouse location, and we weren’t parking a truck outside, we didn’t need a permit, and we didn’t draw unnecessary attention to ourselves by advertising the film shoot inside. Before we even picked up the gear, however, I spent the better part of a week in Photoshop creating an overhead diagram for the benefit of the entire crew. 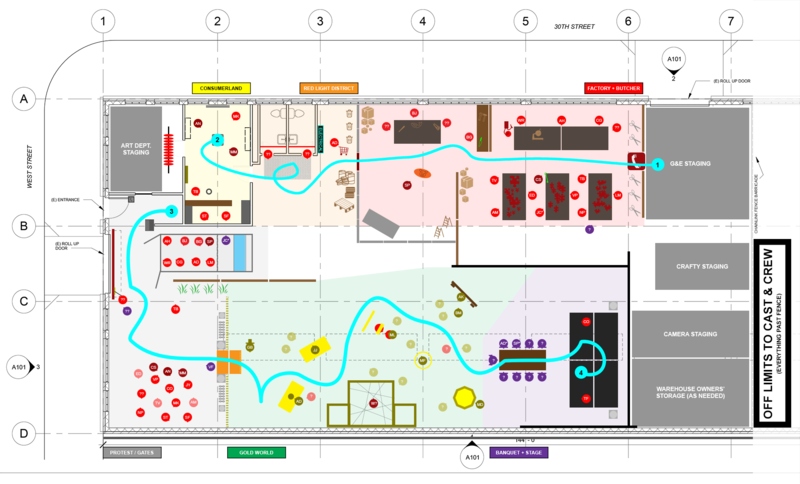 This diagram proved essential to communicate key information among the 100+ collaborators. 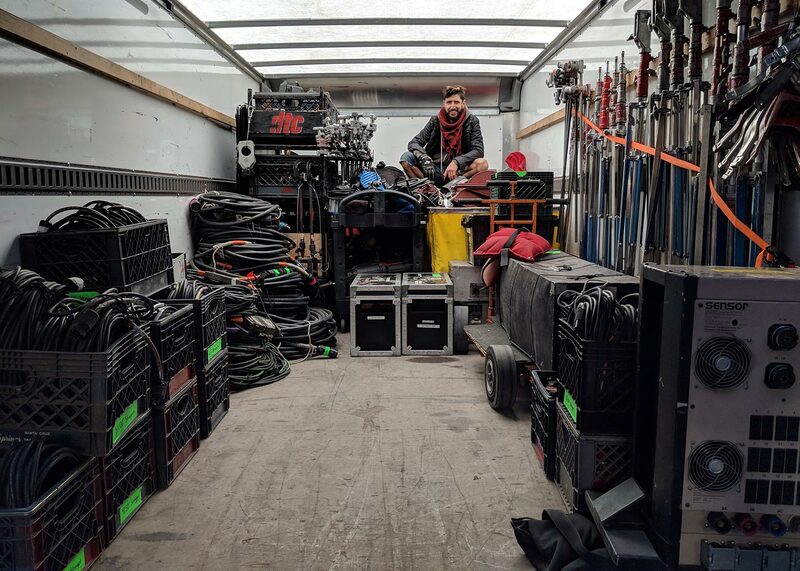 For our Smokin’ Electrics, Zac and Eric (affectionately refered to as “The Boys” going forward), I added layers with additional info for them to use as a guide when they arrived to set. Each space had clearly defined the units, the direction, and the power runs based on the pseudo-grid we were building off of in the sky. 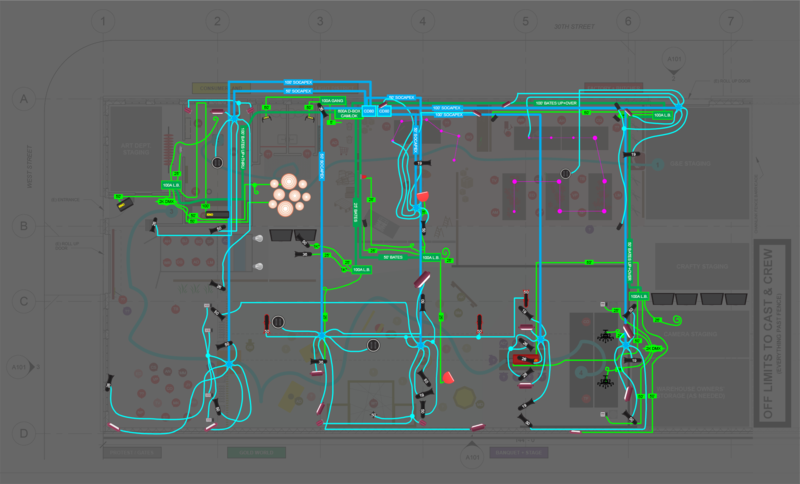 After going through the plan in detail with The Boys, they made some important changes (including completely redrawing the power runs to be much simpler than I had defined) and we marched forward. I made print-outs on 11×17’, laminated them, and distributed copies throughout the set for them to reference. This mostly freed me up to attend to an ever-growing list of tasks as the shoot days approached. 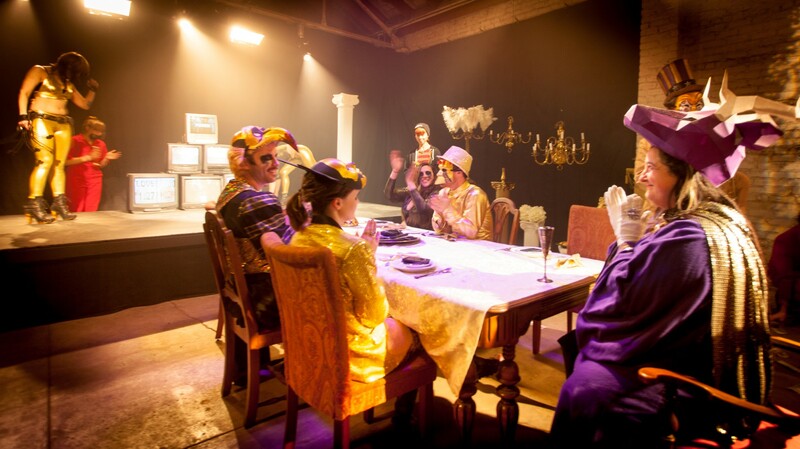 With set design by Chris Swimmer, support from Trevor Banta and with Ad Naka on the 1-2-3-4’s for the choreography, this scene was easily our second-most involved. Pancho enters a factory full of workers (all in red jumpsuits) and pushes a cart past rows of e-waste before eventually entering a butcher shop. 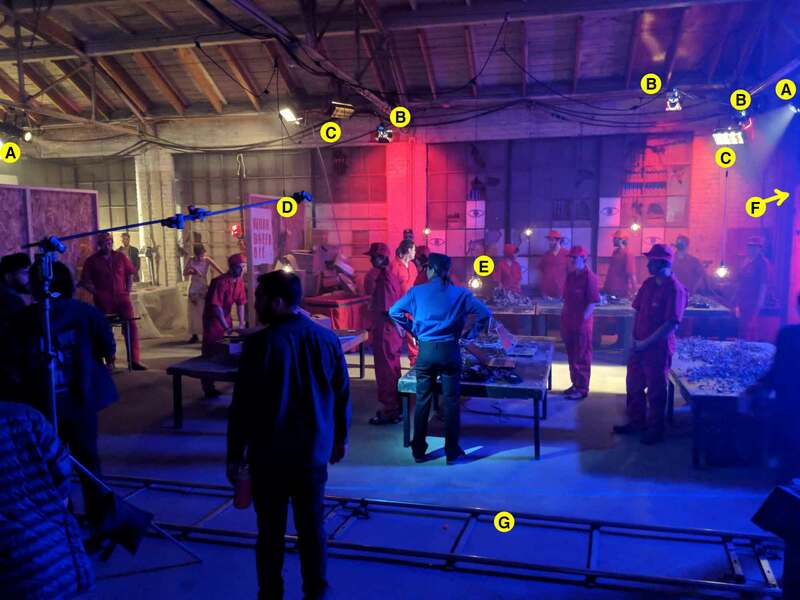 As we track laterally on ~30’ of dolly track, an important key is stolen off of a guard (wearing purple) who is seen briefly in the foreground; the key is passed off to Pancho, foreshadowing a later scene. Perhaps the most exotic of lighting decisions came, however, from something that I discovered on the fly by surprise. The “slits” of light that appear and flare the lens directly behind our pig butcher were created by giving an inch or so’s worth of separation between the set walls (A, B, C above) with three source 4’s rigged at camera lens height and behind the walls by about 10’ (roughly from where the above photo was taken). From behind, it looked as if we were needlessly illuminating the back of the set walls. From inside the set, with the help of a hidden fog machine we’d engage sparingly, the result was three clean, direct, and somewhat unnatural “slits” of light that help to make the scene incredibly jarring. This one wasn’t on the diagram, but happened as I walked past and got stung by light through a mistaken existing crack in the seams —I immediately loved it. Finally, Eric Corriea (seen below rigging the Kino select) taught me a valuable and memorable lesson: “rig to wrap.” In a feeble attempt to help him and Zac get a little further ahead, I was working through the late hours one night running cable and decided to run one of the 100-amp bates cables for them in the sky. Trevor Banta jumped on board to help (he was basically functioning as a swiss-army-knife all week). 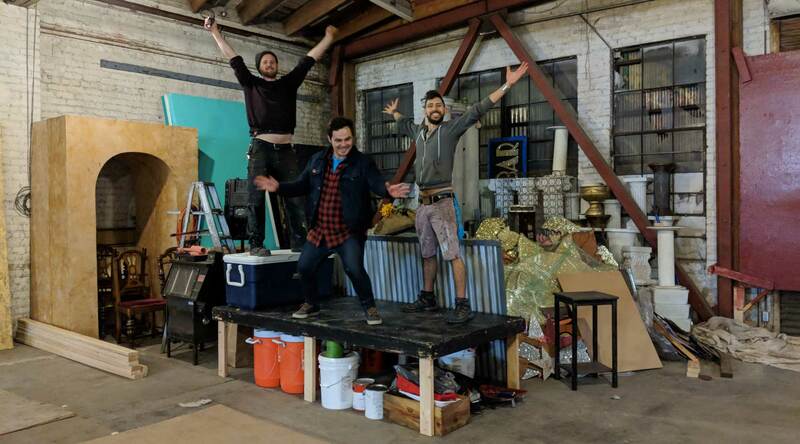 He and I got to work getting the bates cable across the set by throwing it over each and every one of the steel support beams in the warehouse using a “fishing hook” device we constructed – a painstaking and time-consuming process. Doing it this way (with the cables hung above the cross beams) meant it would be just as much of a chore to take down as it was to put up, with the cable needing to be fed through each piece of the pseudo-grid. This was wrong. The proper way to do this, I learned, was to simply tie the cable to the grid with some sash cord, keeping the actual bates cable below the grid. When done this way, all you have to do to wrap the cable is rip out the knot and watch it fall to the ground. I will happily own that one, and will thus never forget it. Eddy at Event Magic was one more true hero of the project. Through the grapevine we heard he was looking to start clearing his inventory and Treigh, master production designer that she is, suggested we go take a look. We hunted through every square foot of his warehouse and tagged dozens of items for pickup with a rented box truck. Many of the large props you see from the film were modified, painted, or upcycled from Eddy’s gracious donations. The “haul” is showcased below.